For my Dragons Across Cultures AP project. Japanese dragon top, Chinese bottom. The main difference come from the subtle variances in their cultural depiction. Aside from the number of toes (Japanese have three, Chinese have four, Imperial Chinese have five. Korean and Vietnamese can vary.) 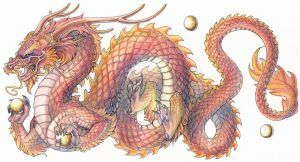 Japanese dragons tend to be drawn with longer faces, bushier eyebrows/mustache and a lack of mane. Worked on for five days, about 5 hours per day. The texture was made by soaking wrinkled sketch paper in coffee. Art (c) to Katie Pfeilschiefter, do not use or repost without permission. EDIT: Wow, this came out of nowhere. I was confused why all of a sudden I had thousands of activity messages and now I see why. I never thought anything of mine was DD worthy. I'm so glad you guys like it. Thanks! Suggester says: "Its circular composition, simple color scheme, detailed inking, and textured background are quite beautiful. This is a print I wouldn't mind hanging in my home." This is absolutely incredible. I don't know what else to say, but this is amazing. OMG THIS IS INSANEEEEEE LIKE WHAAA!!? This would look great as a tattoo!! Beautiful work, especially all your attention to detail! so beautiful! I love your dragons! wow some serious skill......which one do you like more the japenese or the chinese???? I like the Japanese dragons, I prefer the longer snouts and the crazier expressions they're often depicted with. Oh my god this is absolutely amazing! I love your work! I love your exquisite attention to detail. Great drawing !!!! 25 hours of work would have gotten me a big grey blob!! I love the intensity in their eyes! So incredibly beautiful! I love the job with the details. Beautiful work! I love the texture. The details and the composition are amazing! i bought a copy of this print, and its amazing!!! love everything about it! It always annoyed me a tad when people get the two different dragons and their cultures mixed up. Its great to see a correct presentation of these two. the detail on this is really amazing!! I am normally a very articulate person, but I like this so much I can't think of anything to say about it other than it is simply amazing. omg, the detail, you rule! That's so neat, I wish I had a Dragons class! It wasn't a specific class, we were allowed to choose our own topic for the project.